September 28, 1941 was a Sunday too. An early autumn day in Southern New England, clear and mild. Families had probably gone to church that Sunday morning in Connecticut, though some navy yard workers may have slept in having worked so hard to launch the Gato Class submarine USS Greenling (SS-213) at the Electric Boat Co., Groton the previous day. Many were still marking the 3 year anniversary of the Great New England Hurricane that devastated the Connecticut coast and rendered Hollywood screen siren Katherine Hepburn temporarily homeless, having to rebuild her family's home in Old Saybrook. If I don't get any modeling done on Thursday nights, this is why. 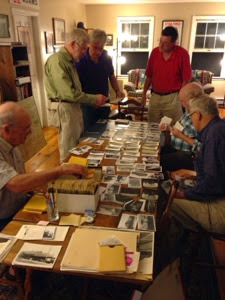 Just about every week a bunch of us get together to catalog the New Haven Railroad photo archive. I'd say that's a pretty good excuse, eh? It's April, 1948 and the Air Line Local is heading back to Cedar Hill Yard in New Haven having made its run up to Colchester, meeting the Valley Local in Middletown. The fireman's doing a fine job keeping a clear stack, but it was still pretty chilly out, as evidenced by the condensing steam coming from J-1 class Mikado #3022. It must've been a pretty hard winter, with lots of snow - note the collapsed barn over on the right. And if you look really closely, you can see a '30s era car and a cool tractor. That tractor is going to be doing some heavy work plowing up those fields, but none of that is on the mind of our photographer, Kent Cochrane. He hiked up to the top of a small rise here in Middlefield, CT and composed an archetypal scene of late steam era branchline railroading in southern New England. Could he have ever imagined we'd be appreciating his work, over a computer "internet," over 66 years later? It's the Summer of 1948 and John Wallace, along with a couple of friends, hear the southbound Valley Local whistling for Nott Street in Wethersfield. They had just enough time to get down to the end of Fernwood Street to watch the train pass. Holding down the left side of the cab, John sees his friend Dave Corsair, in his trademark white t-shirt (nervy for a fireman) and Dave must've yelled over to engineer Bill Beaupre that John had his camera out, because Bill popped out of the cab window too, just as John clicked the shutter. And thus was preserved forever one fleeting moment, an all-too-brief glimpse into a beautiful summer day in 1948. Another shot of a southbound Valley Line train, this time at East Haddam/Goodspeeds - though I'm not sure if this is the Valley Local freight. It's early 20th century - certainly pre-1933 - so it could be a passenger local, stopped at the station. 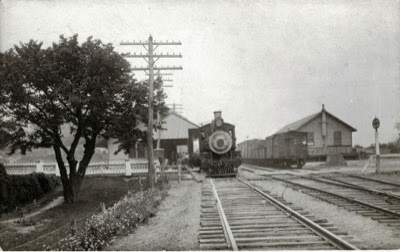 The passenger station is there on the left, but it's long gone today. The freight station remains, somewhat modified and added to. The grade crossing is present-day Route 82. 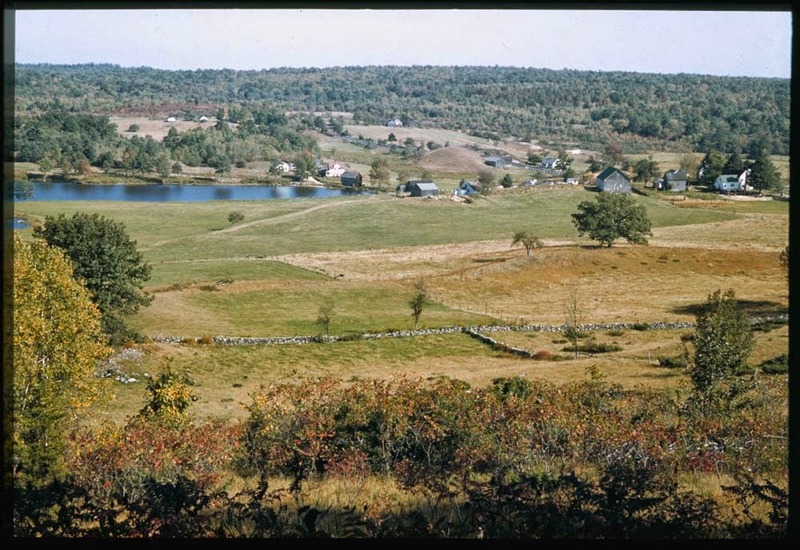 The Connecticut River is just out of view to the right, If we could pan right, we could date the photo based on whether the East Haddam swing bridge is there (built 1913). No matter what the era, the right-of-way and surroundings are immaculate - and the entire scene is inviting. What would we give to be able to climb aboard that train today? Ah, Labor Day Weekend - the Unofficial End of Summer, but more importantly the Official Beginning of Modeling Season. At least that's what it looks like in Internet-land. Apparently, LOTS of folks used the 3-day weekend to make some major progress on their layouts. I'd planned to, but it didn't quite work out that way. I ended up spending most of the day Saturday working on the busted water pipe problem, but first I met John & Roman for breakfast at a great place in Higganum prior to doing something I've wanted to do for a long time - Ride the North End of the Valley Line! The Valley Railroad (dba Essex Steam Train), only runs a little farther north than East Haddam and the Providence & Worcester only goes as far south of just south of Middletown. The track between those two points hasn't seen a train since 1968(? ), but the tracks are still there - going through the forest and buried in the weeds. Fortunately, volunteers from the Friends of the Valley Railroad have restored some sections of track and have started running inspection vehicles and speeders over the line between an unstable bridge to the south and a major washout to the north. And Labor Day Weekend would be my last chance this year to ride this section. Here's our "motive power" for the trip - at Haddam Meadows "station"
It was a really cool trip, especially with John providing some insight to the line (he hadn't ridden that section since the late 1940s) and major kudos to the FVRR folks for making it possible. Afterwards, we went down to Hadlyme to catch the Valley RR's regular steam train . . .
As you can see, there was LOTS happening on the real Valley Line this weekend - just not much happening on the model Valley Line in my basement. 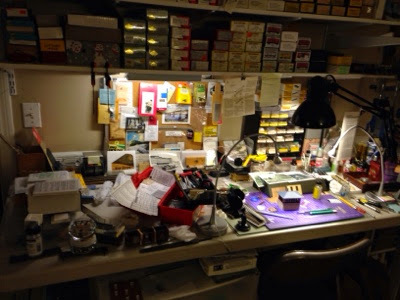 Most of the rest of the weekend was taken up with non-railroad stuff (mowing, cleaning windows, etc), but I did get some basement cleanup done, which is somewhat tangentially related to layout stuff - to the extent I can now find tools and such(!). And I got down to the Saybrook station to watch the trains go by for a few minutes while enjoying a cup of coffee from my favorite place. Bonus: I lucked into seeing Amtrak's latest motive power . . . I'd heard about these locomotives for some time, but hadn't yet seen one in person. Until yesterday. Yup, I actually did get to a little bit of model railroad stuff after all. I broke out the airbrush for the first time totally unsupervised (I'm such a rebel) and pre-painted some structure parts. I'm undecided whether it was smart to do this while the parts were still on the sprues. Seemed like a good idea at the time, and an easy way to handle them. But I'm afraid I may have some touchup to do later, after the build. Next, I'll be doing my first masking job. Any suggestions on what to use for masking tape (other than, um, "masking tape")? So that, in a (large) nutshell, was my Labor Day Weekend. Hope you were able to have some fun too!